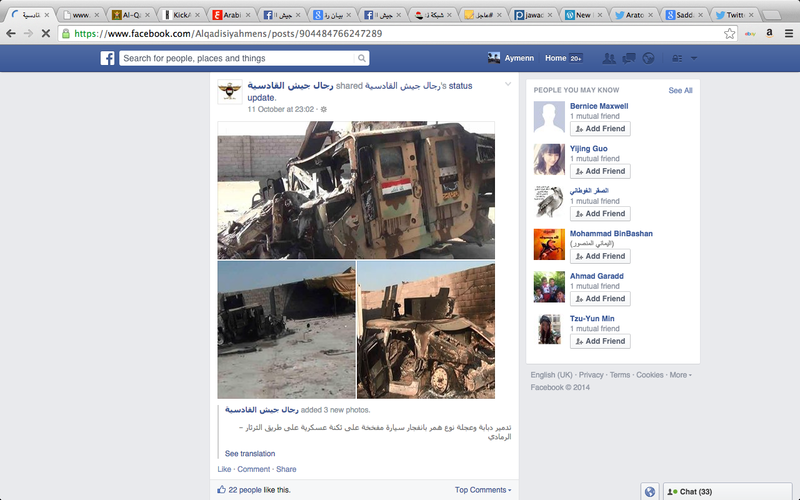 On this site and elsewhere, I have profiled numerous Iraqi Sunni insurgent brands through use of social media. At the same time, it should go without saying that one has to be careful when using material from social media as a source of information: problems we encounter as analysts of the insurgency include groups appropriating credit from others for certain operations, claimed operations that never happened, and even groups that do not actually exist. I examined a case of the last of the aforementioned problems in the spring of this year with a purported 'Jaysh Mustafa'- a brand dating back to the Iraq War- claiming allegiance to what was then ISIS. However, a quick examination showed that the photos used were simply taken from other factions like Jaysh al-Mujahideen. Besides this, ISIS sources showed no awareness of a Jaysh Mustafa, and one denounced it as simply a made-up Ba'athist online entity. The latest ongoing case of a fictional Internet faction is the Tashkilat Rijal Jaysh al-Qadisiya [Formations of the Men of the al-Qadisiya Army/Formations of the al-Qadisiya Men's Army], or simply Rijal Jaysh al-Qadisiya. The claimed group takes its name from Saddam Hussein's rhetoric on Qadisiya as regards the war with Iran in the 1980s- with Qadisiya being a reference to a battle fought between the Arab Muslim invaders and the Sassanid Empire that witnessed a decisive victory for the former. 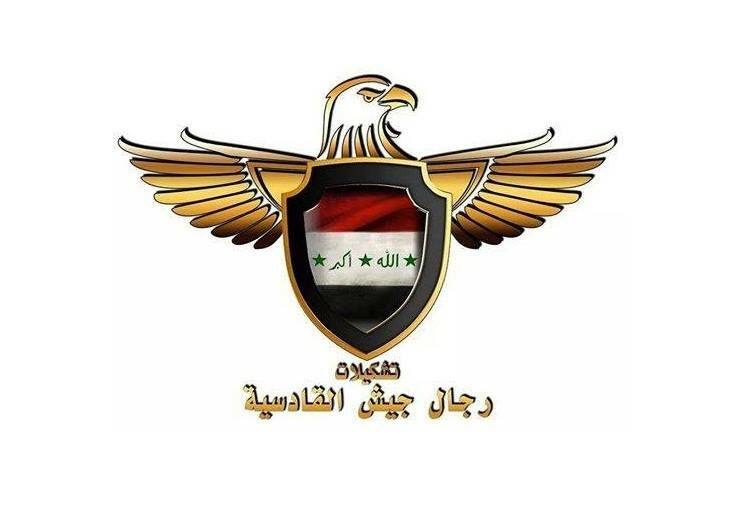 In keeping with the name derivation, the group espouses a Ba'athist ideology, advertising on Facebook- in addition to its own claimed output- statements from the Ba'athist-Sufi Jaysh Rijal al-Tariqa al-Naqshbandia (JRTN) and the General Military Council for Iraq's Revolutionaries. However, a glance at the group's own claimed social media output reveals the same problem as the purported 'Jaysh Mustafa': namely, plagiarising photos from other factions, in particular the Islamic State. Men of the al-Qadisiya Army claiming an operation in the Ramadi area. The photos are taken from the Islamic State's Anbar Province media outlet that put them out a couple of days before Men of the al-Qadisiya Army, which has simply removed the label. 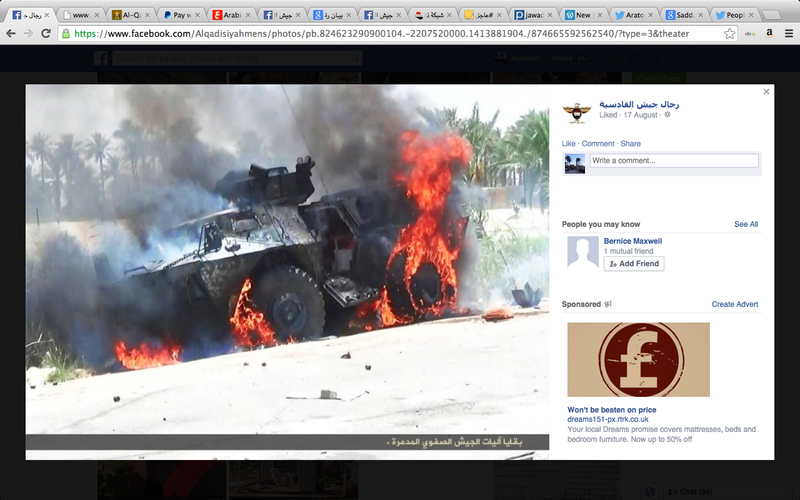 Another photo pilfered from the Islamic State. 1. We affirm that there is no organization called Jaysh Rijal al-Qadisiya on the outset. 2. Whosoever uses this name is a group of frauds trying to obtain criminal wealth at the expense of the blood of the Iraqi people and the reputation of the Iraqi Revolution. In this regard we can also lump in with Rijal Jaysh al-Qadisiya other 'Qadisiya'-type groups such as the "Army of the Third Qadisiya," a purported entity that had released an online statement in keeping with Ba'athist ideology of superficial non-sectarianism while claiming existence as an independent faction and a supposed status as a continuation of the Iraqi army from the days of the 'Second Qadisiya' [i.e. Iran-Iraq War] and the 'Mother of All Battles' [First Gulf War]. Like Rijal Jaysh al-Qadisiya, this 'Army of the Third Qadisiya' similarly has a lack of evidence to demonstrate its existence as a real faction on the ground. Though it would not be worth documenting all fictional entities of Iraq's Sunni insurgency, I offer this case as an example of the need to exercise caution and judgment when using social media. This material cannot just be taken at face value. The most problematic trend in this regard is non-Islamic State pro-insurgency media trying to downplay the Islamic State- also reflected, for instance, in JRTN's refusal to mention the group by name- and accordingly distorting content. The case of the Men of the al-Qadisiya Army fits in with this pattern.